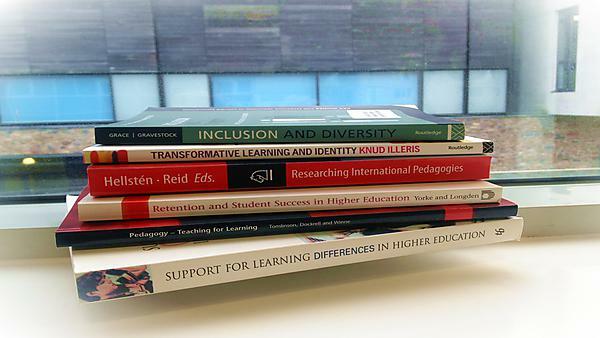 There is a large body of research about inclusive practice in higher education. The list below is not exclusive but suggests a few places to start. As the research tends to focus on specific student groups we have categorised it in this way, e.g. support for disabled students. However, it is crucial to remember that students’ identities are complex – for example, a disabled student is unlikely to feel defined by their disability alone and this is likely to intersect with other factors such as age, gender and race. Although certain groups do have specific requirements, it is important to not categorise students in simplistic ways. Furthermore, very often if you improve teaching and learning for a specific target group, it improves the experience for all students. Mountford-Zimdars, A. (ed.) (2015). Teaching in the context of diversity: Reflections and tips from educators at King’s College London. Waterfield, J. and West, B. (2006) Inclusive Assessment in Higher Education: A Resource for Change. Staff Student Partnership for Assessment Change and Evaluation (SPACE) University of Plymouth: Plymouth. Crozier, G. Reay, D. Clayton, J. Colliander, L. (2008) Different Strokes for Different Folks: Diverse Students in Diverse Institutions - Experiences of Higher Education. Research Papers in Education 23,2, 167-177. Hockings, C. (2010) Inclusive learning and teaching in higher education: a synthesis of research. York: Higher Education Academy. Reay, D., David, M. & Ball, S. (2005). Degrees of Choice: Social Class, Race and Gender in Higher Education. London: Trentham Books. Burke, P.J. (2012). The Right to Higher Education: Beyond widening participation. Oxon: Routledge. Cotton, D., Kneale, P. & Nash, P. (2013) Horizon-Scanning Report: Widening Participation, Retention and Success. Plymouth University: PedRIO. Kneale, P., Turner, R., Collings, J., Webb, O., & Treasure, K. (2018) Exploring the experience of University of Plymouth home-based students. University of Plymouth.PedRIO. Thomas, L. (2002), Student Retention in Higher Education: The Role of Institutional Habitus, Journal of Education Policy 17, 4, 423-442. Berry, J. & Loke, G. (2011). Improving the degree attainment of Black and Minority Ethnic Students. York & London: Higher Education Academy and Equality Challenge Unit. University College London (2014). Video - Why is my curriculum white? Online: YouTube. NUS (2010). Race for Equality. A report on the experiences of Black students in further and higher education. London: National Union of Students. Stevenson, J.A. (2012). Black and minority ethnic student degree retention and attainment. York: Higher Education Academy. Stevenson, J.A. (2012). An Exploration of the Link between Minority Ethnic and White Students’ Degree Attainment and Views of Their Future ‘Possible Selves’. Higher Education Studies, 2, 4, 103-113. Cotton, D., Kneale, P., & Nash.P. (2014) Investigating the experience of care leavers at University of Plymouth Final report. Cotton, D., Nash, P. & Kneale, P. (2014). The Experience of Care leavers in UK Higher Education. Widening Participation and Lifelong Learning 16, 3, 5-21. Dixon, J., Wade, J., Byford, S., Weatherly, H. and Lee, J. (2006) Young People Leaving Care: A Study of Costs and Outcomes. York: The University of York. Fuller, M. Bradley, A. & Healey, M. (2004). Incorporating disabled students within an inclusive higher education environment, Disability & Society 19, 5, 455-468. Gibson, S. (2012). Narrative accounts of university education: sociocultural perspectives of students with disabilities. Disability & Society, 27, 3, 353-369. Rickson, M. (2010). Disability equality in higher education: a synthesis of research. York: Higher Education Academy. Riddell, S., Tinklin, T. & Wilson, A. (2005). Disabled Students in Higher Education: Perspectives on Widening Access and Changing Policy. Oxon: Routledge. Carroll, J. & Ryan, J. (2005). Teaching International Students: Improving Learning for All. London: Routledge. Crozier, G. & Davies, J. (2008). The trouble is they don’t mix: self‐segregation or enforced exclusion? Race Ethnicity and Education 11, 3, 285-301. Jones, E. (2010) (ed). Internationalisation and the student voice: Higher education perspectives. London: Routledge. Equality Challenge Unit (2009). The experiences of lesbian, gay and bisexual staff and students in higher education. London: ECU. National Union of Students (2014). Education Beyond the Straight and Narrow: LGBT students’ experience in higher education. London: NUS. Reay, D., Ball, S. & David. M. (2002). It’s Taking Me a Long Time but I’ll get There in the End’: Mature students on access courses and higher education choice. British Educational Research Journal 28, 1, 5-19. Stevenson, J. & Clegg, S. (2013). ‘My past is a double edge sword’: temporality and reflexivity in mature learners, Studies in Continuing Education 35,1, 17-29. Equality Challenge Unit (2011). Religion and belief in HE: researching the experiences of staff and students. London: Equality Challenge Unit. Stevenson, J.A. (2013). Discourses of inclusion and exclusion: Religious students in UK higher education. Widening Participation and Lifelong Learning 14, 3, 27-43. Hinton-Smith, T. (2012.) Lone Parents' Experiences as Higher Education Students. National Institute of Adult Continuing Education: Leicester. Moreau, M. (2012) Supporting Student Parents in Higher Education: A Policy Analysis. London: Nuffield Foundation. Moreau, M. & Kerner, C. (2013) Care in academia: an exploration of student parents’ experiences. British Journal of Sociology of Education, 1-19. How can I be more inclusive? Why is inclusive teaching and learning important?